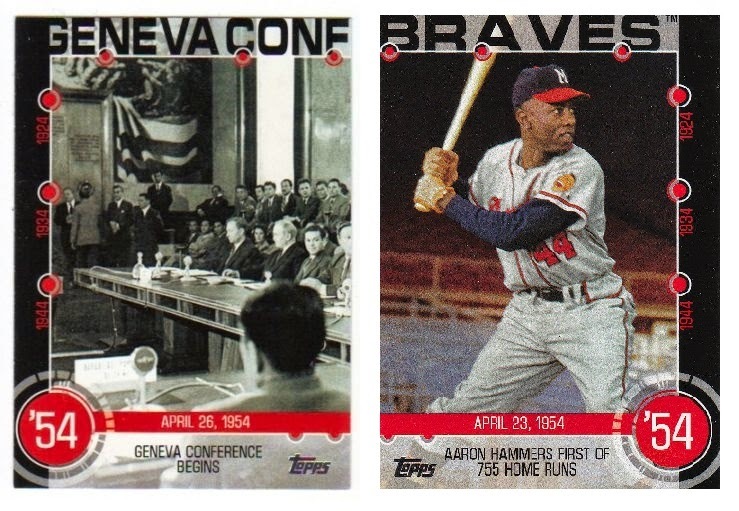 The checklist from 2015 Topps Series 1 Baseball shows a Baseball History insert set. The 30-card set features just 15 numbers with an A or a B next to it. The reason for this is that the two cards make up one bigger card in a way. Side A has a moment in history such as the start of the Geneva Conference or the Polio Vaccine being found safe or MLK’s March on Washington. Side B has a baseball moment within a few days – or even on the same day – as the historical moment putting baseball into a historical context. You will notice no border on the right side of the card. This card has no border on the left side. When you put the two cards together, the design matches to create a bigger card putting these two moments in history together. Ah, that's cool. I had thought these inserts were a bit pointless at first, but the whole match-em-up aspect is neat.